Pseudohyponatremia: is that a thing? As most stories do, this one begins with a case. I was on call over the weekend, it was busy, and I was called by the neuro ICU for a new consult. Their patient had been hyponatremic for days and everything they tried had failed. 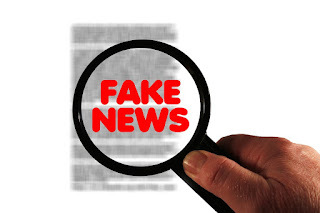 They had treated the patient as having cerebral salt wasting with normal saline, sodium chloride tablets, furosemide, fluid restriction, and fludrocortisone, to no avail. The consult call was for consideration of hypertonic saline. As I began to look through the chart, I noticed something startling. At the time of admission, when the serum sodium was 124 mmol/L, the serum osmolarity was within the normal range at 272 mosm/L. The patient was not azotemic and thusly I knew that tonicity was similar to osmolarity and I suspected that we were dealing with was pseudohyponatremia. Pseudohyponatremia (not to be confused with isotonic or hypertonic true hyponatremia) occurs when there exists a larger than normal solid state in plasma. A common question posed is why is it that normal saline is “normal” when it is in fact hypertonic to plasma? This is because we need to differentiate plasma and plasma water. Plasma is the liquid component of blood not consisting of blood cells and platelets. The percentage of plasma in whole blood is calculated by 1-hct. Components of plasma include water (typically ~93%) with suspended proteins, lipids, glucose, clotting factors, and hormones. If the percent of proteins or lipids are elevated, the solid phase of plasma will take up a higher concentration and will affect the measurement of serum sodium by artificially lowering the plasma water percentage. For a visual explanation of this phenomenon, please see the image below excerpted from Joel Topf’s Fluid, Electrolyte, and Acid-Base Companion (posted with permission). The sodium measurement technique is particularly important in the determination of true vs pseudohyponatremia. The gold standard is measurement with direct ion specific electrode potentiometry. However, more common methods utilized in most hospital laboratories include indirect ion specific electrode (ISE) potentiometry and the older technique, flame emission spectrophotometry. Typically, most basic metabolic panel analyzers use indirect ISE and blood gas analyzers use direct potentiometry. Indirect ISE involves a premeasurement dilution of plasma and due to this an assumption is made during measurement that the percentage of plasma water is 93 percent. Thusly, when this assumption is not true, measurement of the sodium concentration from an ABG can help clarify true vs pseudohyponatremia. There exist a few conditions that can classically cause pseudohyponatremia. Hyperproteinemia – Any cause of hyperproteinemia can result in an increase in the solid phase of plasma. This is classically described in multiple myeloma patients but can occur as an effect of IVIG or be seen in the hyper gammaglobulinemic state of chronic infection. Typically, serum protein levels are greater than 10 g/dL. Hypertriglyceridemia – An elevated level of triglycerides can also increase the solid phase of plasma, this is typically seen in extreme elevations with triglyceride levels of greater than 1,000 mg/dl. At these levels the blood will have a milky appearance and may even be noted to be frankly lipemic limiting evaluation. Hypercholesterolemia – Recent case reports have highlighted that in liver failure, particularly in obstructive jaundice, that there can be a non-lipemic hypercholesterolemia resulting in pseudohyponatremia. Lipoprotein analysis has shown that the primary lipoprotein responsible for this is Lipoprotein X. The pathogenesis of lipoprotein-X in cholestasis is not completely understood. Interestingly, reviews of LCAT deficiency (in which lipoprotein X also accumulates) do not typically describe hyponatremia or pseudohyponatremia as part of that diseases milieu. A controversial issue is the proper terminology of the hypertonic hyperosmolar hyponatremia from hyperglycemia. It has been described both as pseudohyponatremia and true dilutional hyponatremia. Glucose is tonically active and is dissolved in plasma water. In the patient with hyperglycemia induced hyponatremia glucose can be a large component of osmolarity. Water leaves the intracellular space and equilibrates the osmolarity of the ICF to the ECF in patients with hyperglycemia. Hence, while some may call this as pseudohyponatremia (noting that the hyponatremia in this case does not mean hypo-osmolarity), I would argue that the better designation is dilutional hyponatremia. Menchine et al evaluated the accuracy of blood gas vs biochemistry testing in Emergency Room patients presenting with diabetic ketoacidosis (DKA). They found excellent correlation between the blood gas (direct ISE) and biochemistry (indirect ISE) sodium measurements, supporting the designation of dilutional hyponatremia over pseudohyponatremia. To conclude, it is oft quoted that the first step in the workup of hyponatremia is to confirm that it is in fact true, hypotonic hyponatremia. In our patient referenced earlier, I wrote my consult note and recommended checking sodium by direct ISE and it was 134 mmol/L compared to indirect of 126 mmol/L. We then measured triglycerides and the result was greater than 1,000 mg/dl. All sodium directed therapies were held without adverse effect. Once again, nephrology saves the day! 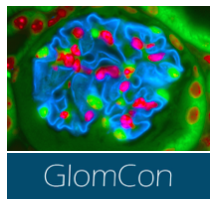 "All that glitters is not gold" is a typical saying that alludes to the difference between appearance and evidence; it is undoubtedly one of the most common sayings by Mexicans and one of the ideas present when citing the Mexican National Transplant Program. 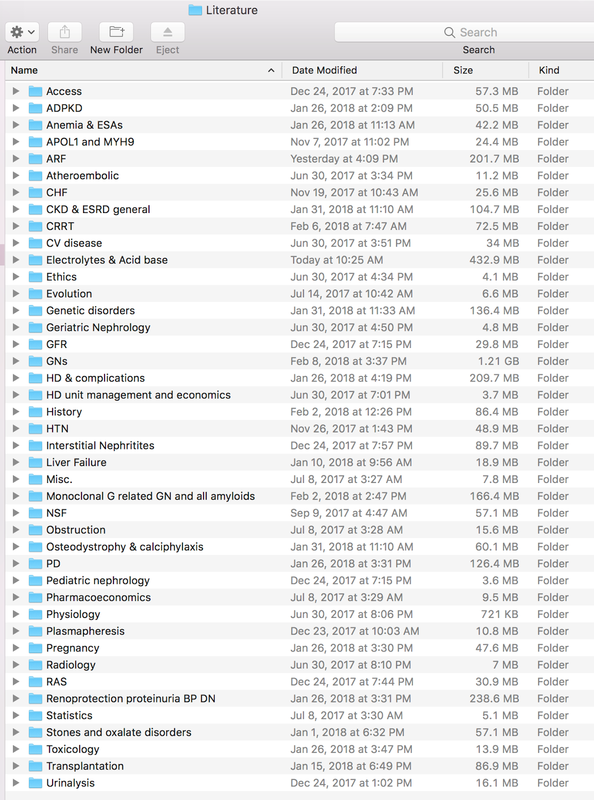 I am about to start my third year of training in Nephrology in a high specialty center in Mexico City and I have faced the daily practice of applying protocols of the Mexican transplant system which has gone through multiple changes in its structure and organization due to the alarming reports of incidence of chronic kidney disease in the country. Unravelling the data of a national kidney transplant program is complicated given the fact that success rates depend on multiple aspects as it can even be so diverse in different entities within the same nation. So, what are the most relevant aspects in the Mexican National Transplant System? I have considered the following 4 aspects as the most transcendental: 1) The Mexican health insurance and the history of the current national transplant program, 2) The number of candidates on the waiting list and the waiting time for kidney transplant, 3) The total number of kidney transplants, which includes living-donor and deceased-donor kidney transplant recipients and 4) The differences associated with the institutions that provide healthcare to the Mexican population, as well as national data about graft and patient survival. Health insurance and historical review of the Mexican transplant program. In Mexico, social security and health insurance have had multiple changes in recent decades. The first and largest social security institution in Mexico and even in Latin America, The Mexican Institute of Social Security (IMSS by its acronym in Spanish) was created in 1943. The IMSS currently covers approximately 30.42% of the Mexican population; it shares this responsibility with other institutions such as the Social Security Institute for Service of State Workers (ISSSTE) and the National Defense Department health care system, similar to the VA system in the USA. Another national organization that provides health coverage is the program of the Ministry of Health called "Popular Insurance", in which the coverage is based on socioeconomic status, lowering the cost of health services through a federal subsidy. It covers approximately 36.55% of the population. Private health services covers a little less than 1% of the population. It has been reported that 25.4% of the Mexican population are uninsured or not affiliated to any of these institutions. During the creation of the Mexican Transplant Program in 1976, the National Registry of Transplantation was designed as well. This program was implemented a few years after the first Mexican kidney transplant was performed in 1963. Subsequently, the National Transplant Center (CENATRA by its acronym in Spanish) was founded in the year 2000. Prior to 2000, no organization was overseeing the statistical data and activity of organ donation and transplantation.According to CENATRA, as of June 2017, there are 248 authorized transplantation programs, however, it only monitors the activity of 120 of them, because not all programs have an active license. 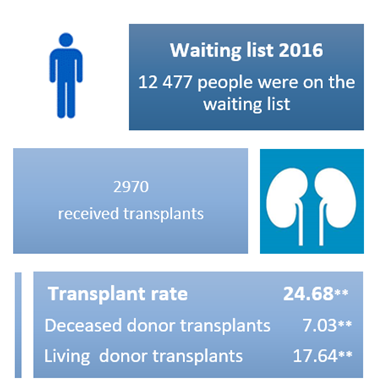 According to the latest report by the National Registry of Transplants, there are 21 686 patients on the national transplant waiting list, 13 956 candidates (64.3%) waiting for a kidney transplant. 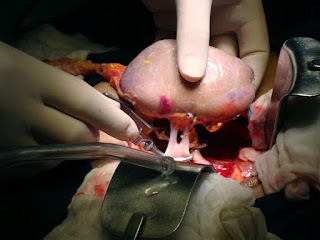 Concerning the combined transplant, there are 4 candidates on the kidney-pancreas transplant waiting list, 3 candidates on the kidney-liver transplant waiting list and 1 candidate on the kidney-lung transplant waiting list. 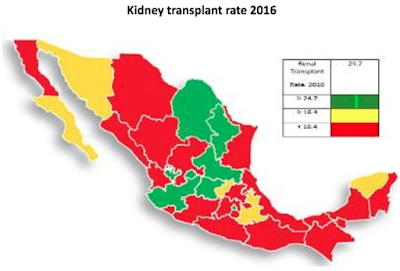 In 2016, a total of 3,028 kidney transplants were performed in Mexico, with an average waiting time for kidney transplant (both living and deceased donor kidney transplant) of 11.63 months. Furthermore, the average waiting time in the deceased donor kidney transplant list is 29.86 months. Data on living donor kidney and deceased donor kidney transplant. This proportion contrasts with statistics from other countries. Living-donor and deceased-donor kidney transplant donation programs are necessary to achieve adequate coverage for kidney transplant recipients; However, the need for organ donation continues to surpass the supply. In countries with organ donation systems based on deceased donors, kidney transplantation from a living donor is considered a complementary activity to their programs, since it represents only 10% of the total percentage of transplantation. It also contrasts with the national report of the USRDS where approximately one third of the total transplant is a living donor. In recent years, organ donation campaigns have increased to promote kidney transplantation; however coupled with the uncertainty of health insurance coverage organ donation rates have not improved. In some instances, cultural factors represent barriers to living donation. For instance, a small percentage of the Mexican population, refuse organ donation due to concerns of body mutilation representing approximately 40% of the cases. . Will our Mexican ancestral beliefs about death be a barrier to improve organ donation? So far we do not have national data on dissemination or impact of the use of promotional campaigns. One of the most interesting findings is the discrepancy of results among the medical institutions that perform kidney transplantation. In 2016, the IMSS had 13,731 potential kidney transplant recipients in the waiting list, private health insurance 2,541 candidates, and popular health insurance had 1,053 candidates. Although IMSS covers approximately 30% the Mexican population, it has the largest kidney transplant waiting list that includes around the 71 % out of all cases and the highest kidney transplant rate which reached 55% of the total of transplants performed in Mexico. As of September 2017, of the 33 states of the country and of the 795 kidney transplants performed, 46% (368) of the transplants had been performed in two of the country's largests cities, Guadalajara and Mexico City. Although these statistics may correspond to the population rate of these cities, it shows the disproportion of specialized centers that have a multidisciplinary team to perform a kidney transplant, so that people living far from these areas are less likely to be able to benefit from the programs.. Undoubtedly, it will be of interest and public benefit to have specialized centers in all the entities together to look for alternatives such as the application of telemedicine. Although at present, according to national data reports, there is no information on graft and recipient survival, there is available data from a transplant center with the highest transplant rate at the National Medical Center, part of the IMSS, where 1,185 patients were followed up for 12 months post-transplant and patient survival was 97.2% and graft survival rate was 95.5% during the first year. In the cohort, graft loss was defined as serum creatinine >4.0 mg/dL. Even though kidney transplantation may be limited, a model to perform kidney transplantation in the uninsured low-resource population has been implemented in a single center in Mexico, which a financial mechanism sharing public, patient, and private foundations funds. Long-term results are expected. 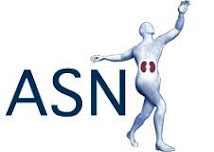 In conclusion we have so many barriers for transplantation and much remains to be done, such as accurate statistics of kidney transplant outcomes, promote kidney transplantation with emphasis on potential cadaveric donors and decentralize the access to health care. 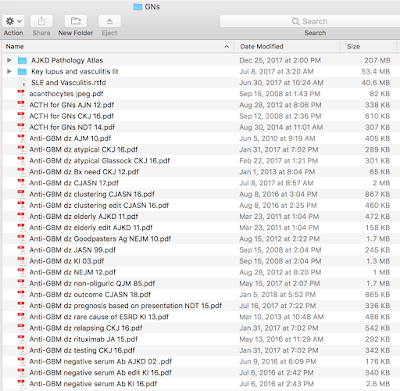 How to organize your scientific PDF library? During my training I downloaded and collected tons of journal articles for future reference. Most of these articles were in a pdf form and I had assigned these to variously named folders for easy retrieval. Most of us probably have some version of such “digital library” on over laptops/desktops. And, I am confident in saying that when the time comes to find THAT specific paper – we struggle. 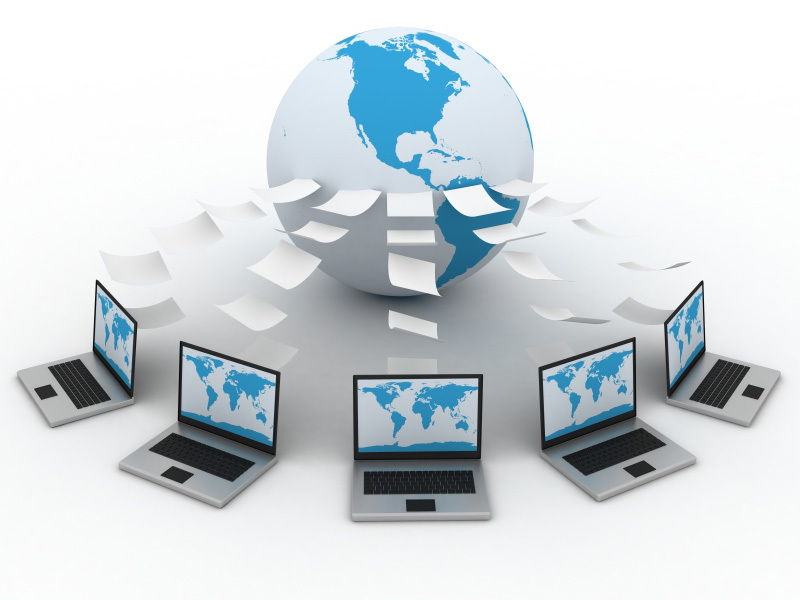 Digital organization is not our forte! I scoured the internet for ways to improve my digital library arrangement, watched videos read blogs and even made a new folder in my library about managing a digital collection of papers!! Eventually I started using Mendeley for reference management and file organization. While the reference management part was good, I was still not happy with the file library organization function. Knowing that I was not the only one with this difficulty, I posed my question to ASN Communities, hoping to tap into the collective wisdom of the ASN. And sure enough, I received some excellent answers that I will summarize next. Dr Edgar Lerma, a Chicago Nephrologist has an innovative and user-friendly way of organizing references. 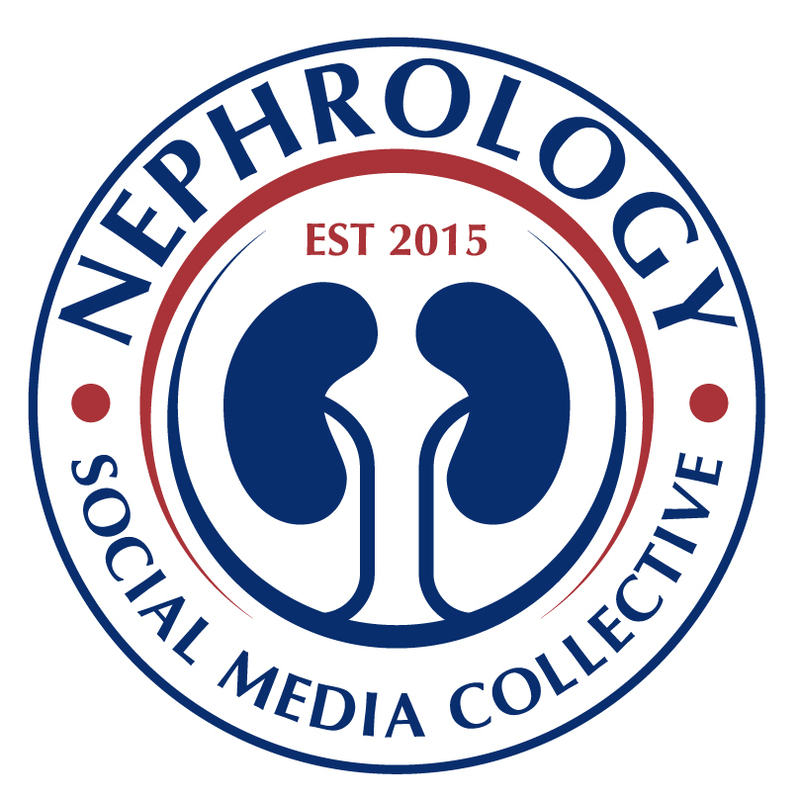 He created a twitter hashtag #Nephpearls to link tweets with reference articles/material. He organizes papers by firing off a tweet with the hashtag #Nephpearls AND the subject of the paper, with an online link to the pdf (if free) or PubMed (if gated). To make it even more enticing he usually has a figure or a table from the paper attached to the tweet. In this way, papers are archived online for everyone who wants to retrieve it. As an example say - you are looking for Cardiorenal syndrome, all you have to do is to type in the hashtag AND topic (#Nephpearls Cardiorenal), in the search bar in twitter and this will result in several relevant tweets with figures, tables, clinical trials, excellent reviews, textbooks and even comics, all related to cardiorenal syndrome. Everyone can share in this library using the same method as Edgar. He adds these nephrology pearls (Nephpearls) regularly. Brilliant! Rarely a day goes by that he doesn't add an article or two. 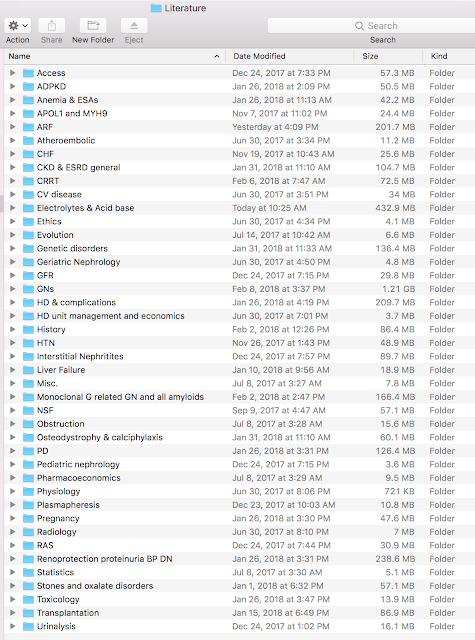 In the same vein, Dr. Nikhil Shah a nephrologist at the University of Alberta, began using Google Drive for creating and sharing a literature library with his co-fellows and staff during his fellowship years. In addition to the Dr Rodby’s list of folders (see above), he incorporated presentations from staff and other fellows to this library. These presentations are Core Nephrology teaching presentations and Nephrology Grand Rounds presentations at the University of Alberta. 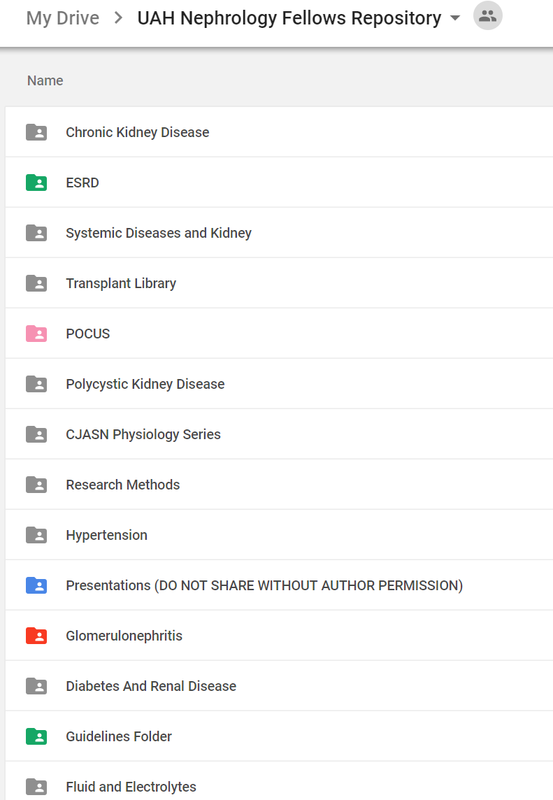 This Google Drive is shared within the Nephrology group locally and provides an enduring collection of teaching material to all fellows and faculty. Another important well-organized source of high-yield landmark trials in nephrology is the online site (ukidney.com) created by Dr. Jordan Weinstein. It is organized in nine major categories (see picture below). It also includes a separate section for #VisualAbstract. 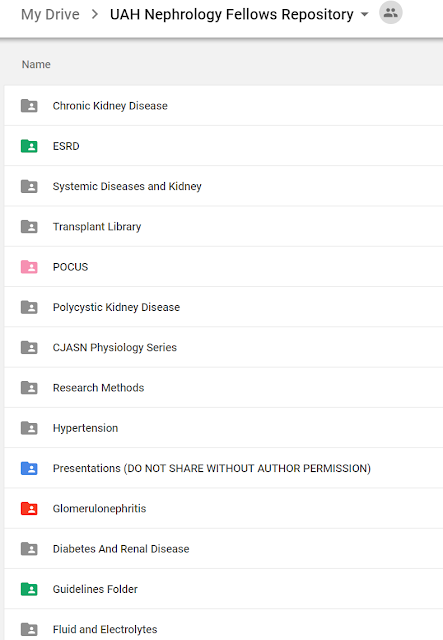 I used Rodby's way to organize my digital library, and screen #Nephpearls and ukidney for topics I am looking for. So, what is your method to this madness?? Share with us your organization methods and I will include them here as well. Nephrology Web Episode - The Kidney Biopsy!